I wanted the euphoria to subside before saying thank you. The new glass enclosure looks fab, and we are delighted. A special thank you to Darren, Nick, and Charlie. Both the removal, and the installation were very challenging but they prevailed, and were highly professional, and industrious throughout. Wouldn’t hesitate to use Shower Power again. With the Show House officially opened at Kingswood & Midhurst I would like to take this opportunity to say a massive thank you for your effort that has gone into finishing these stunning properties. Everything looks amazing. The survey was efficiently carried out and the fitters work was clean and accurate. It is a perfect fit, particularly when account is taken of the fact that the walls either side were different heights and the ceiling slopes either side were different too. 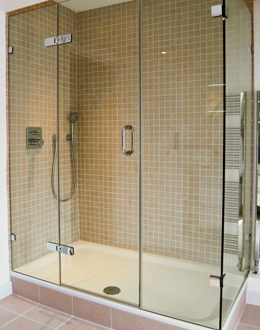 The Showerpower team offered an outstanding service from start to finish. The Showerpower team offered an outstanding service from start to finish. From the initial telephone and email enquiries, through to the design and installation, they were polite, courteous, responsive and professional. In fact, during an installation issue (that was not of their doing) they went way beyond their remit in fixing the problem themselves so that the install could be completed that same day. The whole procedure was dealt with efficiently, professionally and politely. From design to fitting the whole process was excellent! Thank you for the expert service. After a complete design, measuring and fitting service with high quality products? Showerpower is the company to use. It was the focus on total customer satisfaction that I was very impressed with. They were efficient, courteous and totally customer centred in a way that is pretty rare these days.